Finally got round to watching this on DVD. It was described as "outrageously funny". I'm not sure whether it's just me, but apart from the occasional isolated moment, I found the humour in this film a bit flat. In fact the film struck me as a bit flat throughout, with a cast that seemed to be struggling to find something funny to amuse us with. Good production values in terms of sets, costumes, etc., and some otherwise excellent actors, but what a waste. 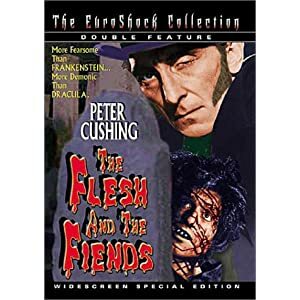 I would much rather watch the 1959 Peter Cushing version of this story, Flesh and the Fiends. I did wonder how they would successfully manage to make this rather grisly "true" story into a comedy. As it happens, it doesn't look as if they did, not to me anyway. Saw this at the flicks and enjoyed it muchly. Haven't seen The Flesh And The Fiends for years but can understand your preference, David. Erm....have you seen Vernon Sewell's Carry On Bodysnatching (shurely Burke and Hare (1971)) with the naggingly annoying but catchy Scaffold theme tune? Glad you enjoyed it. For me the film had its odd moments, but too few to make it anything other than a failure. A pity as I've liked Simon Pegg since he did Spaced, then Shaun of the Dead, though I feel he's gone off the boil since then. Hoping that Paul, which I hope to see soon, and in which I've been told he's back on form, is a lot better. Never even heard of Vernon Sewell's Carry on Bodysnatching. Burke and Hare left me cold as well. Paul isn't bad, but...just doesn't have the charm of the other films. I reviewed John Landis' B&H (5/10) for Black Static #21. Freddie Francis' Doctor & The Devils is much better 'horror' version, IMHO. Burke and Hare was a very missed opportunity... if only for the fact that Isla Fisher didn't get her puppies out. It had it's moment, but everyone was trying too hard to be funny... when the script was patently obvious written without any jokes. Ronnie Corbett was funny, though.